Exam and Treat Pet Vet Play Set 24 Pcs. The sturdy wooden play center features an �x-ray� lens with two removable x-rays, pet scale, blood pressure monitor, sink, treat chute, pump bottle dispenser, and lots of storage. There are hooks and holders for lots of accessories. 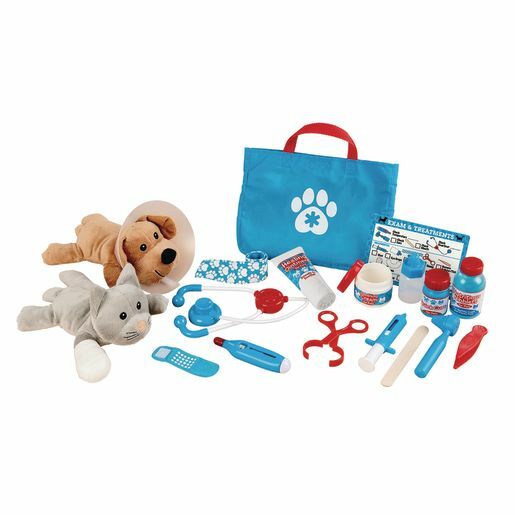 Grooming play set accessories included: blow dryer, shampoo, conditioner, towel, brush, shears, clipper, nail clippers, spray bottle and ear wipes, checklist, collars, name tags, decals and stickers. Pet center measures 34-3/4"L x 20-1/2"W x 33"H.
Grooming Accessory Set: Give an animal friend a special treat! Pamper a plush puppy and keep it cuddly and clean with realistic grooming accessories! Wash and fluff with shampoo and conditioner bottles, a towel, brush, and a dryer that makes noise. Trim with vibrating shears, scissors, and nail clippers, and treat with flea and tick �spray� and ear wipes. Arrange for grooming services with a reusable checklist, and add a personal touch with collars, name tags, decals, and stickers for the precious pooch! Pet center: detailed assembly instructions are included (assembles with just a Phillips-head screwdriver, not included).